Community leaders are working to calm fears and find ways to prevent an anti-Muslim, anti-immigrant backlash in the wake of two arrests related to an alleged terrorist plot in Kingston, Ont., yet the probe has already touched off a political debate over security screening for refugees. Islamic community groups, mental health workers and police officers met earlier today to discuss their concerns about the broader community implications after the RCMP's national security team charged one youth with two terrorism-related offences and arrested an adult male named Hussam Eddin Alzahabi in connection with an alleged plan to detonate explosives at an undisclosed location. Bronek Korczynski, who led the family's sponsorship through Our Lady of Lourdes church, said the community groups that met today will attempt to head off rumours and spread the message that the alleged offences have nothing to do with Islam. "This is not about casting aspersions on any faith community, on any identifiable ethnic or racial group. 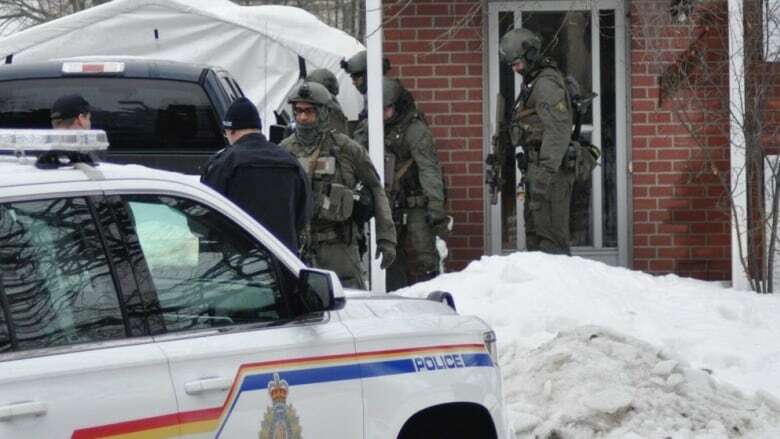 This is about an individual or individuals who have been involved in something that was brought to the attention of police," he told CBC News. "We have to be very careful not to burden the rest of the community because of the actions, the bad actions, of one of them," he said. "We have to be very careful not to exploit this in order to make a political point." "This certainly doesn't suggest in any way, shape or form that Canadians shouldn't remain open to support newcomers, whether they're immigrants or refugees," he said. "It is also clear that Canada's refugee screening process needs to be seriously examined," he said in a statement. "We've recently learned of several examples of dangerous individuals entering the country due in part to lax screening procedures." Scheer pointed to a 2017 audit of the Canada Border Services Agency which found that potential security threats may not have been identified due to lax screening. "This is completely unacceptable and must be immediately remedied," he said. "Conservatives will continue fighting against Justin Trudeau's attempts to weaken Canada's national security laws and implement real policies to ensure that Canada's streets and communities are safe." Last night's arrests came just hours after Trudeau warned Canadians to expect "fearmongering" over immigration in the run-up to the fall election. At a town hall meeting in northern New Brunswick, a young Syrian refugee thanked Trudeau for allowing her family to come to Canada, drawing applause from the crowd. Trudeau said in an era of rising intolerance and misinformation about migrants, Canadians have a responsibility to engage in "a positive and a thoughtful way." Kingston Liberal MP Mark Gerretsen accused Scheer of doing exactly what the PM warned of, and called the Conservative leader's remarks "extremely unfortunate." "Every time there's a loose connection or that he sees a potential loose connection that can create division and fear in communities, he's going to jump on that opportunity," he told CBC. "I think what Canadians have to ask themselves is, 'Is this what we look for in a prime minister? Is this what we look for in a leader?' I'm confident the answer is going to be no." Gerretsen, a former Kingston mayor, declined to comment on a potential backlash in the community because the RCMP had not yet released details on the cases. But he said the community should feel reassured that police acted to intercept a potential security threat. According to a bulletin posted to the website of a Kingston-area Catholic church detailing the journey of the Alzahabi family, the family's sponsorship application was approved in the spring of 2016, but the family was still awaiting its final security and health checks that fall due to the "overwhelming number of applicants." At the time, the government of Prime Minister Justin Trudeau was working to bring more than 50,000 Syrian refugees to Canada through government and private sponsorships. According to the bulletin, five committees were working diligently to prepare to welcome the family and had raised more than $30,000 to assist their resettlement. A storage room was rented to hold donated furniture and supplies, and an extensive support binder in Arabic and English was assembled to ensure a smooth transition. The Anglican Diocese of Ontario and the Roman Catholic Archdiocese of Kingston, which support refugee sponsorship and resettlement programs, issued a statement after learning through the media that one of the individuals arrested was a member of a sponsored family. "As the investigation evolves, we support the work of law enforcement. Our concerns, thoughts and prayers are for the Kingston and surrounding area, the faith communities involved, the family and all those affected by this unfortunate situation," the statement says.